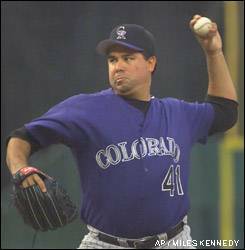 What are your all-time favorite uniforms in each of the major team sports? What about your all-time least favorite uniforms? Why do the Pittsburgh Steelers put their logo on only one side of their helmet? Why do the Steelers, Pirates and Penguins all wear black and yellow? Because those are the colors of the Pittsburgh city flag. Why don't the White Sox wear white socks? They used to, back in the franchise's early days. White started disappearing from their socks in the '40s and had vanished almost entirely by 1953 (although white stirrups reappeared for the 1959 World Series, and again -- with blue sanitaries! -- in 1969 and 1970). But as to the larger question of why they went away from white, the surprising answer is that nobody seems to know. There's a good treatment of this question here. Why do the Islanders have those four stripes on one shoulder? They represent the franchise's four consecutive Stanley Cups in the 1980s. Everyone loves the Chargers' powder-blue jerseys. Why don't they go back to wearing them full-time, instead of just once or twice a year? The team's owner is very fond of the current design and wants to keep it. My friend says the 49ers were going to switch to a totally different helmet design a few years back, with "49ers" on the side of the helmet instead of "SF." I say no way. Who's right? 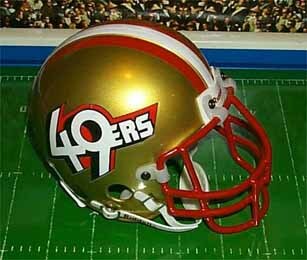 In 1991, the 49ers created a prototype for a new helmet design, which they even introduced at a press conference. But fan reaction was so overwhelmingly negative that the idea was scrapped the next day. What's the Expos' logo supposed to be? Actually, there are two separate interpretations -- one in English and one in French. English version: The overall outline of the logo is a stylized "M" for "Montreal" (you kinda have to squint to see this). The red "e" on the left is for "Expos," and the blue "b" on the right is for "baseball." Add it all up and you've got "Montreal Expos baseball." The strip of white next to the "e" is essentially just wasted space -- it's not an "l" or anything like that. French version: The red symbol on the left is a "c," which combines with the white strip to form a "d." Toss in the "b" on the right and outlined "m" and you've got c-d-b-m, for "Club du Baseball Montréal." What's the deal with the "H" inside the "C" in the Canadiens' logo? The Canadiens are frequently referred to as the Habs or les Habitants, and many people mistakenly think that's what the "H" stands for. But that's wrong -- the "H" actually stands for "hockey" because the franchise's official name is Club de Hockey Canadien. Why does Fresno State have that "V" on the back of their helmets? The "G" logos used by the Packers and the University of Georgia, and formerly used by Grambling, all look the same. What's the deal? Which one came first? The "G" originated with the Packers. Some background info on all three logos is available here. Why do some NFL players have their full names on their jerseys, instead of just their last names? The rule in the NFL is that if two players on a team's roster have the same surname, then they must also wear their first initial ("P. Lukas" and "R. Lukas," say). But if their first initials are also the same, then they must wear their entire names ("Paul Lukas" and "Peter Lukas"). In 2005, for example, the Bears' roster included Bryan Johnson, Tank Johnson and Todd Johnson. Bryan simply needed his first initial, but Tank and Todd had to wear their full names. Why do the Heat wear the NBA logo on this side of their jersey, when every other team wears it on the other side? Because the little flame coming off of the "T" extends too close to the area where the logo would normally appear. Although the flame doesn't appear on the team's alternate road jersey, they keep the logo on the same side for consistency's sake. And by lucky coincidence, putting the logo on that side turned out to be very convenient for the team's 2005-06 throwbacks. Why do baseball and basketball teams wear white at home, but football teams wear white on the road? And what's up with the NHL? Early baseball teams had a hard time finding good laundry facilities while traveling, so they started wearing gray on the road, because it hid the dirt better. Early football teams often had only one jersey, usually colored. Some teams also had a white jersey for use on the road, but this was generally worn only if the two teams in a game had similar color schemes (which is pretty much how it currently works in European soccer). When games started to be televised, road whites became more important, because many colors looked the same on black-and-white TV. So the TV era also marked the start of the two-jersey era. But keep in mind that under current NFL rules, football teams don't truly have "home" and "road" uniforms -- they simply have white and color, and the home team gets its choice of which one to wear. Although most teams choose to wear color at home, there are several, like the Cowboys and Redskins, that prefer to wear white at home. honor of the league's 75th anniversary). This is the period of hockey most of us are familiar with, so we tend to think of white as the natural home color, even though it wasn't always that way. The NHL switched back to wearing colors at home in 2003. Why? The official reason was that the league wanted home fans to be able to see the colored uniforms; the unofficial and more accurate reason is that sales of colored jerseys were lagging, so they wanted to give them a higher profile. Some hockey minor leagues actually have it both ways, wearing white at home for the first half of the season and then switching to white on the road for the second half. Even the people at the NBA office are unsure of why basketball became a white-at-home sport, although factors like laundry access and black-and-white TV probably had something to do with it. Keep in mind, though, that several pro teams have worn colors at home, including the Lakers, who continue to do so. Others have included the Warriors (yellow), Sonics (yellow), Bullets (orange), Cavs (yellow), and Spurs (silver, when they were in the ABA). Why don't you write more about soccer, the world's most popular sport? My knowledge of soccer is very limited, so I don't feel well equipped to write about it. Readers frequently bring soccer-related uni developments to my attention, however, and whenever possible I try to pass along that information within the column. Is there a Web site that lists which uniform combo each NFL team will be wearing for each game? Are there Web sites that show the uniform histories for each sport? Yes. Baseball's uni history is available here; pro football's history, back to 1959, is here, with pro and college helmet designs here; and NHL uni history is available here. I'm not aware of any site that covers the NBA's uniform history, although loads of old jerseys are displayed here, and the ABA's uniforms are showcased here. There's a uni-related photo I want you to see. Should I send it as an attachment, or just send you its URL? For a variety of reasons, I strongly prefer to receive a URL. So if there's a photo on the Web that you want to show me, please don't download it and send it as an attachment -- just let me know the URL of the image, or the page where it's located. But if the photo isn't on the Web (because you took it yourself, or you scanned it from a hard copy, or someone else forwarded it to you, or whatever), then go ahead and send it as an attachment. Why don't you put all of the photos on the same page as the text, instead of formatting them as pop-up links? I can't just take photos that have been published elsewhere and publish them on an ESPN.com page -- there are copyright issues. But I can link to other people's pages, so that's what I do. Also, the typical "Uni Watch" column has dozens of photo links -- there'd be no way to fit all of those images onto the same page as the text anyway. How come I can't access some of your older ESPN.com columns? Page 2 content is freely available to all for 45 days after it's published. After that, it's only available to Insider subscribers. I just read a column from your archive, and some of the photo links came up as "Page not found." What gives? Unfortunately, link rot is a fact of life, especially with wire service photos, which are usually kept on servers for only three or four weeks. I try to choose photos whose URLs will stay active, but sometimes it isn't possible. The one thing I can guarantee is that the links all work when a column is published. Oh yeah? Then how come I just looked at your new column today and some of the links came up as "Access Denied," or something like that? Occasionally I link to a blog or a small personal site that can't handle all the hits from ESPN.com's large readership. So the site crashes, or it exceeds its bandwidth limit and is shut down by its ISP. I've gotten much better about anticipating this type of problem (or at least I think I have) and now try to avoid these types of links. Why do you hate purple so much? I actually think purple in nature is quite nice -- eggplants, violets, plums, etc. But purple in manmade design applications has always struck me as really tacky. Like, seriously, have you ever seen a purple car? A total nightmare. Same goes for purple clothing, especially uniforms. Don't you realize purple is the color of royalty? Sure, but so what? I live in America, a country whose very conception was predicated on anti-royalty sentiment. Maybe that's why, as I like to point out, not a single U.S. state uses purple as one of its official state colors. If that doesn't fill your heart with patriotic pride, nothing will. Why do you get so worked up about the Nike and Reebok logos appearing on uniforms? Because the only logo that belongs on a team's uniform is the logo of the team itself. The relationship between fan and team is very special -- players come and go, they retire, they're traded, and so on, but the fan stays loyal to the team, to the logo, to the uniform, no matter who's wearing it. That's an unusually pure form of brand loyalty, and it shouldn't be sullied or cheapened by the presence of any other brand logos. I've designed a new logo and uniform for my favorite team. Who should I send it to? If I send it to you, can you forward it to the proper person at the team, or maybe to the league office? I know you don't want to hear this, but pro sports teams and leagues aren't interested in unsolicited uniform designs -- don't bother. I want to become a uniform designer. Where do I start? First, get a degree in graphic design. Then join a brand-design firm that works with the major sports leagues, or get a job with the properties division of one of the leagues. Simple, right? My son's Little League team needs new uniforms. Which colors should we use? Do you think we should go with vests? I'm flattered that you'd ask, but I'm in no position to make those sorts of decisions for you. For what it's worth, I think forest green and mustard always look great together, and of course I'm unalterably opposed to any use of purple. But the best thing you can do for a Little Leaguer is to teach him (or her) to wear stirrups. Why do you love stirrups so much? Because they look cool and they're unique to baseball. When did the "Uni Watch" column begin? May of 1999. It originally ran in the sports pages of The Village Voice (they already had a column devoted to hockey fights, so adding a uniform column wasn't much of a stretch). It was a very small column in those days, and it was designed primarily for print, not for the Web, so there weren't any photo links (you can see that material here). When the Voice sports section was eliminated in 2003, I briefly moved the column to Slate.com, where I started taking advantage of all of the photos available on the Web (that material is here). Then, in August of 2004, I moved the column to ESPN.com, where I added the News Ticker, expanded the follow-up sections, and so on. I hope this will be the column's permanent home -- I have no desire for "Uni Watch" to become the Todd Zeile of sports journalism. How'd you get the idea to write about uniforms? I'd always been a big sports fan, and I already had a lot of experience writing about the small details of brand design, package design, industrial design and so on. Applying that sensibility to uniforms seemed like a natural next step. Plus I wanted to help document the sports world's visual history, which is something done in many other industries but hadn't been done very much in sports. Plus-plus my girlfriend got tired of hearing me say things like, "Look, look at his socks!" (or whatever) while pointing at the TV. Do you write about other things besides uniforms? Yes. I write regularly about food, travel, business, advertising, design, pop culture, Americana, and pretty much whatever strikes my interest at a given moment. I'm a full-time freelance writer. Are you the same Paul Lukas who used to publish the 'zine Beer Frame back in the 1990s? Yes. Unfortunately, almost all my back-issues of Beer Frame are now sold out, except for issue Nos. 7 and 8 (if you're interested in purchasing them, contact me). A small sampling of old material from the zine has been preserved here. What about your 1997 book, "Inconspicuous Consumption: An Obsessive Look at the Stuff We Take for Granted"? The book is out of print, but used copies are pretty easy to find. Why don't you write a book about uniforms? I'm working on an idea for one -- stay tuned. Are you related to the old Hollywood actor Paul Lukas, who won an Oscar for "Watch on the Rhine"? No. But he has a star on the Hollywood Walk of Fame, and I have a photo of that star on the door to my apartment. Which jerseys do you have in your closet? People are often surprised to hear that I'm not a jersey collector. I only care about what the players wear -- I'm not looking to dress up like them myself (plus, I hate wearing polyester, which is what all the jerseys are made of these days). I do have a few old heavy-wool baseball jerseys from high school and factory teams, which I've found at flea markets and secondhand shops, but I tend to think of them as "cool vintage clothing," not "cool uniforms." Do you collect any other sort of uniform-related stuff? Yes. I really like old uniform catalogs from sporting goods companies -- the older, the better. I have a nice little library of these, many of which still have the original fabric swatches pasted onto the pages. I also collect the uniform style guides published by the various sports leagues. I'm not interested in selling any of this stuff, so please don't ask. But if you have any catalogs or style guides that you want to sell, contact me. I'm trying to find a particular replica jersey -- do you know where I can buy it? Again, I'm just interested in what the players wear. I'm not particularly knowledgeable about the retail and merchandising sides of the uni world. Sometimes I forget which day your column appears, or I'm too busy to check ESPN.com to see if it's there. Is there a way I can be notified when new installments of the column are posted? Yes. Send me a note and ask to be added to my mailing list. In addition to receiving a signal flare each time a new column is posted, you'll also be notified when I'm doing live Internet chats, the occasional TV appearance, etc. How can I get to be the Uni Watch intern? I've toyed several times with the idea of having an intern. But for various reasons I always end up deciding that I'm better off producing the column by myself. If you're really determined to change my mind, you're welcome to try -- it could be a fun collaboration for the right person. You're really nitpicky and you write about clothes -- so, like, you must be gay, right?